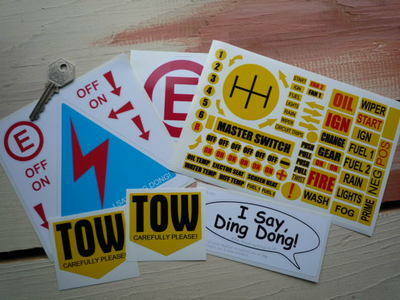 Race Car Switch Dashboard Tow Stickers Pack. 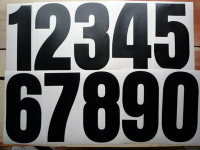 A set of race car stickers including everything you need to label up your race car dash etc. All the indentification arrows and labels that you could wish for. As used on our sponsored race car to win the Goodwood St Mary's Trophy 2011, and proudly sold all over the world to racers just like you. Set includes 1 x Dash Set (comprising of 75 individual pre-cut stickers), 1 x Electrical Cut Off Set, 2 x Tow Carefully Please, 1 x Large 80mm Extinguisher 'E' and 1 x I Say Ding Dong Speech Bubble. 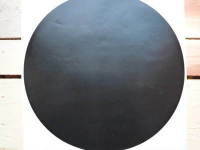 Stickers are in varying sizes, for example & comparison, Tow stickers are approximately 65mm by 55mm and Electrical Cut Off Triangle is approximately 125mm by 120mm.